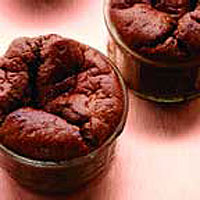 The word soufflé means 'to puff up' in French, and a well-cooked example is a triumph of taste and pleasure over gravity. Eaten hot, it seems especially decadent. If you want a perfect chocolate puff with a mousse-like texture, try this recipe from Darren Purchese, executive pastry chef at The Bentley Hotel in London. Preheat the oven to 200°C, gas mark 6. Using a pastry brush, liberally coat the inside of 8 x 200ml ramekins with 25g of the soft butter. Ensure the brush strokes are vertical to help the soufflé to rise easily. Grate 40g of the chocolate and use to coat the buttered ramekins, ensuring the whole surface is covered. Chill until required. Chop the remaining 60g chocolate and set aside. Mix the cocoa, flour and cornflour. Melt the remaining 40g butter and stir in to the dry ingredients. Bring the milk to the boil in a saucepan and pour on to the flour mixture, whisking to remove lumps. Transfer the mixture back to the saucepan and place over a gentle heat. Cook gently, whisking, until the mixture thickens. This happens quite quickly. Whisk over the heat for another minute to cook the flour, then remove from the heat and add the chopped chocolate. Stir until completely melted. Add the egg yolks and mix well. Transfer the mix to a bowl and place a sheet of clingfilm on the surface to stop a skin forming. In a large bowl, whisk the egg whites and sugar until stiff peaks form. Remove the clingfilm from the chocolate mixture and stir in 1/3 of the egg white to loosen the mix. Carefully fold in the remaining egg white with a metal spoon, taking care not to knock the air out of the mixture. Spoon the mixture into the ramekins, filling them to the top and shaking them gently to settle the mixture. Put in the oven immediately and bake for 12-14 minutes until risen but still soft to the touch.